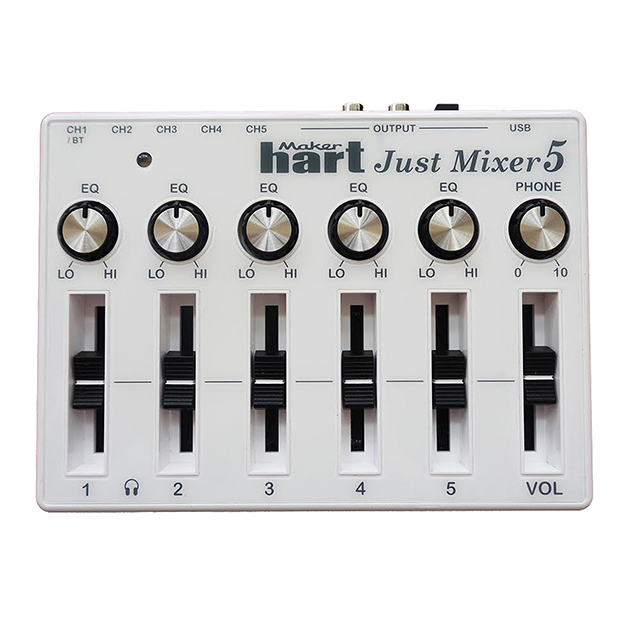 Just Mixer 5 - 5 channel audio mixer with bluetooth - Product | Maker hart Industry Corp.
JUST MIXER 5 is designed and produced by professional sound equipment makers “Maker hart”DJ mixer. Just Mixer 5 not only has the same volume slider control as last version JUST MIXER, but also raise up amplification to 35dB, so that you can use with most electronic device (computer, smart device, MP3 player, electronic instruments, Amazon Echo/Echo Dot, etc. ), even dynamic microphone※ also can be used with easily. Moreover, it has USB Audio Interface. You can output audio data by USB cable to do Computer music mixer. Also have outputs stereo RCA, it is easy to connect with home audio. 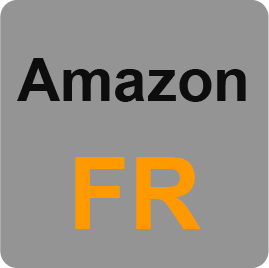 It’s suitable for gaming, webcast, computer music, street performance or DJ mixing work. 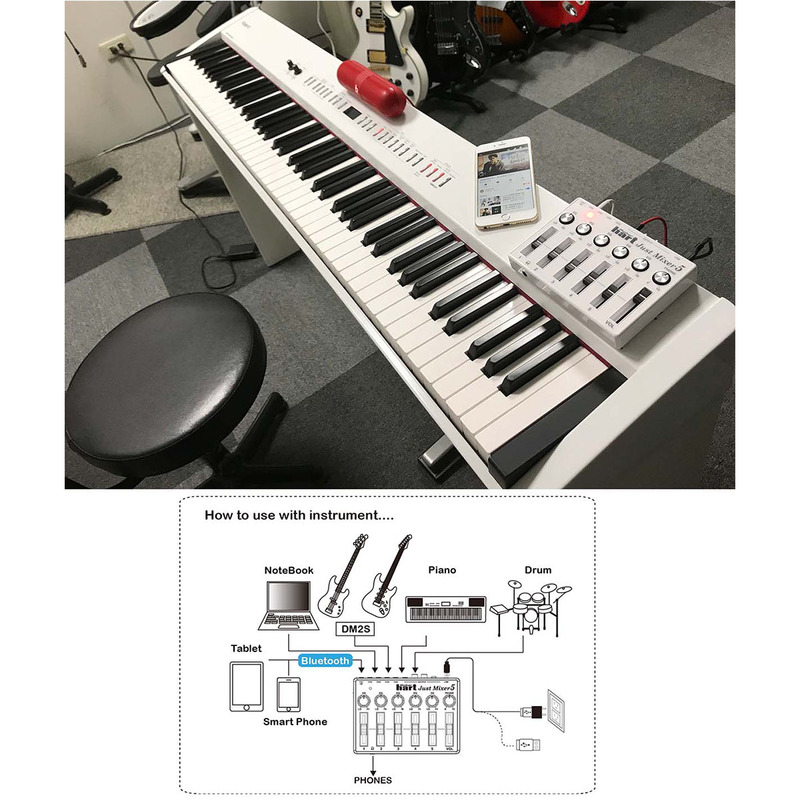 Additional Bluetooth function, it can easily connect to other Bluetooth device, playing music by home audio speaker instead of Bluetooth speaker. 5 in/2 out: The Just 5 allows up to 5 stereo connections (or up to 10 mono ones) with 2 output jacks. 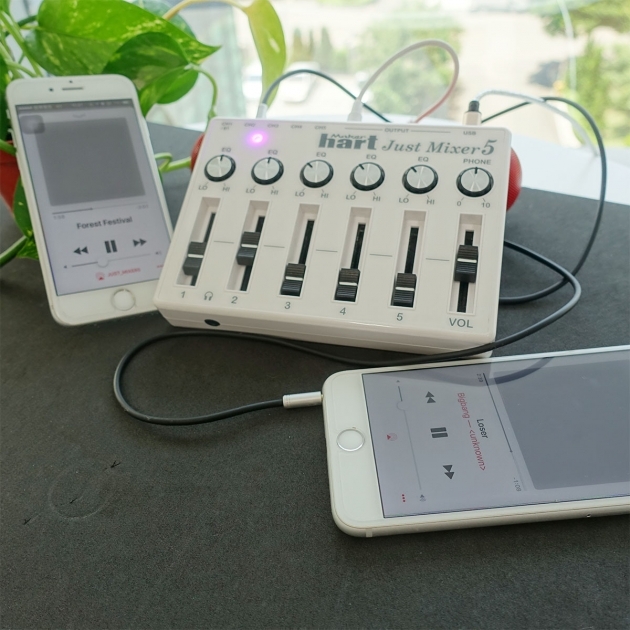 Bluetooth compatibility: Minimizing the need for cables, the Mixer’s channel 1 allows you to transmit audio to the device from your smartphone or other Bluetooth devices! Connect to a computer through a USB cable to monitor your mix. 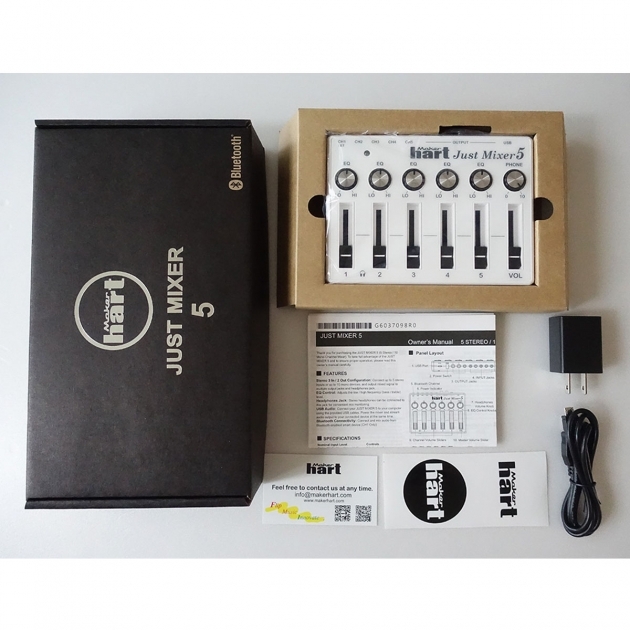 The Just Mixer 5 is also powered through the same cable. 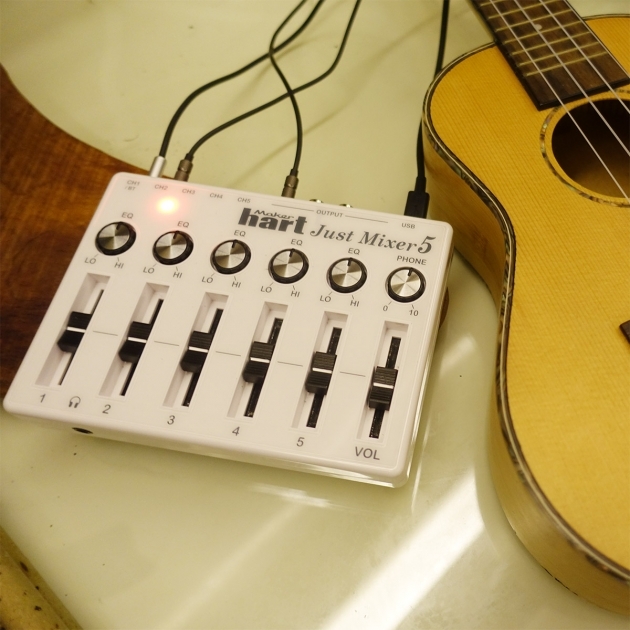 The headphone jack allows you to plug in a pair and monitor the mix even if the output devices are not connected. Compatible with smartphones, microphones, computers, MP3 players, Amazon’s Echo/Dot, game consoles, musical instruments, DJ equipment and more! 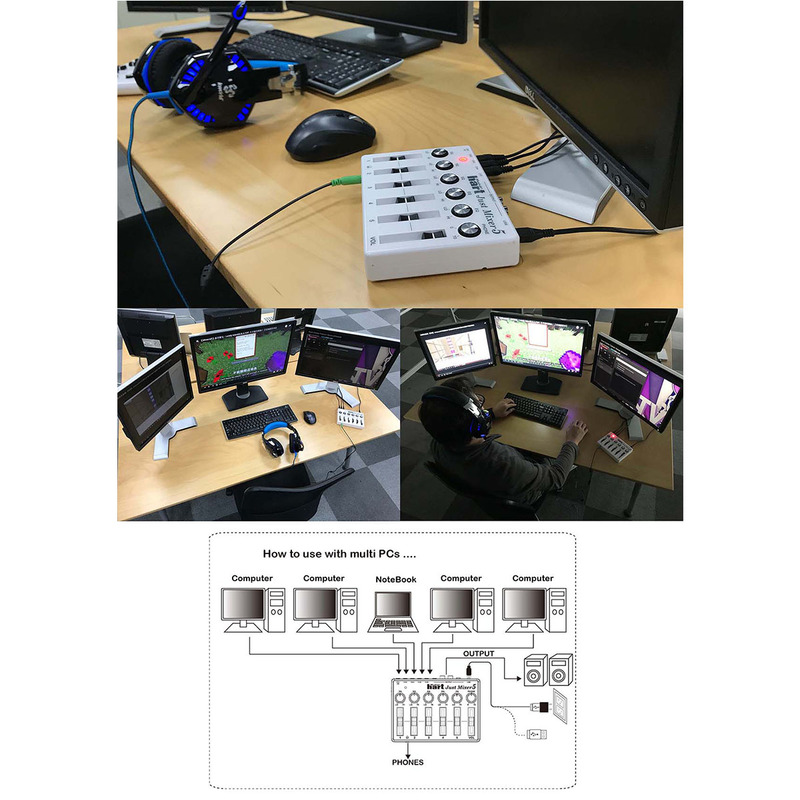 Stereo 3 In / 2 Out Configuration: Connect up to 5 stereo inputs , and output mixed signal to multiple output jacks and headphones jack. EQ Control: Adjusts the low / high frequency (bass / treble) level. Headphones Jack: Stereo headphones can be connected to this jack for convenient mix monitoring. 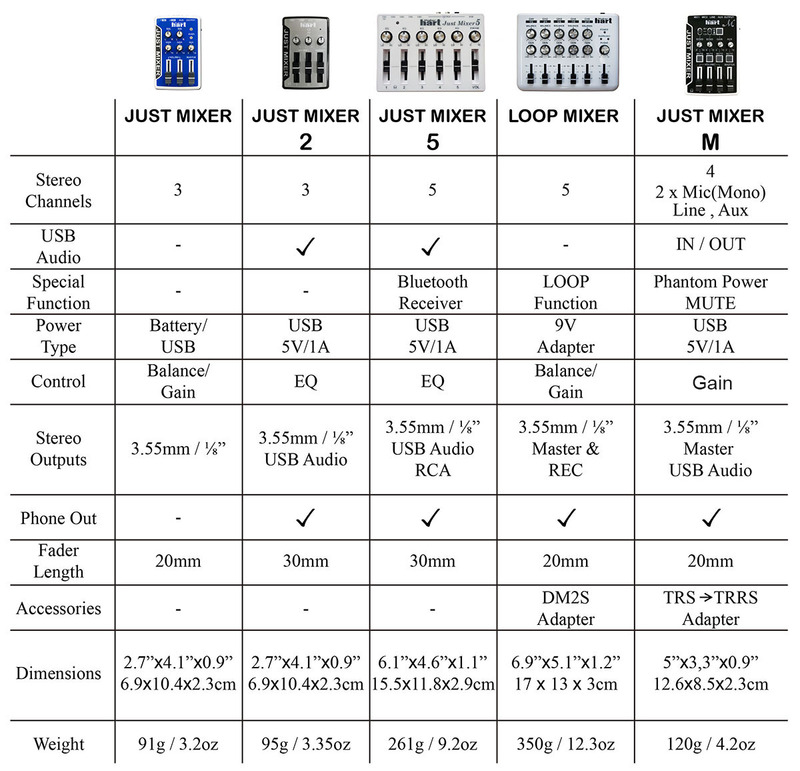 USB Audio: Connect your JUST MIXER 5 to your computer using the provided USB cables. 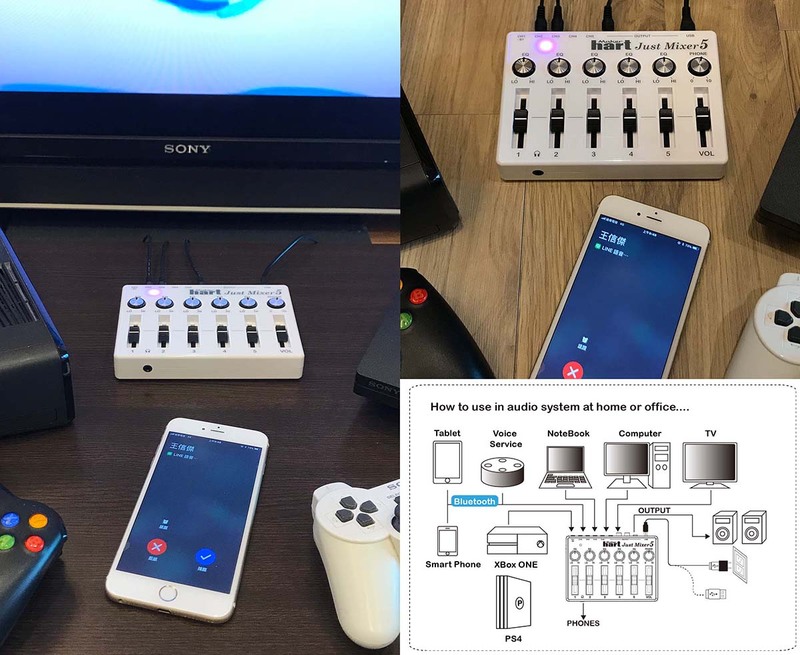 Power the mixer and stream audio output to your connected device at the same time. ※ USB Audio sampling rate: 48KHz/16bits. 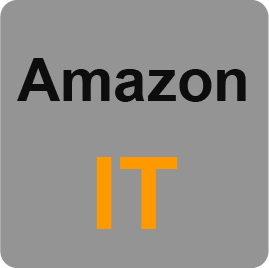 Bluetooth Connectivity: Connect and mix audio from Bluetooth-enabled smart device (CH1 Only). 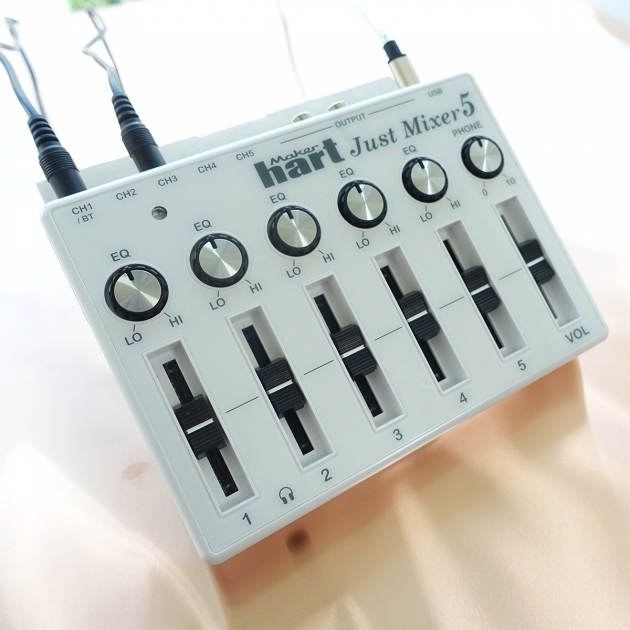 The versatile, high-quality and multiple-jacks mixer you had been waiting for! Please check your Voltage before payment.